Single board computers (SBC) are a great way to run some simple linux or Android software with hardware that is small and low power. Wiring up some peripherals like cameras, sensors, or any other custom electronics is the most common use for these little hardware gems so it makes sense that it should be easy to make nicely designed expansion boards for them. I just created a few EAGLE libraries that are hosted by Element14 that captures these boards so they can be easy to expand upon, similar to the one I created for common Arduino boards. 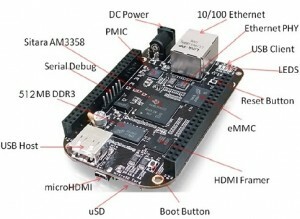 There is one for each the BeagleBone Black, RIoTboard, and Raspberry Pi Compute module. The libraries are designed for someone to either (a) start a custom board with a schematic symbol and package to represent the SBC or (b) document their project that is skywired into an existing board with just a symbol (by using the ‘EXT’ version, which has no package). I think the Rpi Compute one will be the most popular. You can drop in a fully functioning linux box the size of DDR2 memory into any design in no time thanks to this library! Just watch out for some of the trace impedance specs as noted on the schematic.